Africa south of the Sahara is arguably the richest region of the world when it comes to birdlife. From the big and flightless to the small and colourful, if it flaps, there's a good chance you'll find it here. Perched majestically at the helm of this avian menagerie is Africa's biggest and baddest raptor: the martial eagle. With a two-metre (six-foot) wingspan and enough predatory prowess to scoop up an impala lamb with ease, this handsome eagle has wowed many a binocular-wielding birdwatcher. Recent research, however, shows that twitchers are finding it more difficult to spot the continent's largest bird of prey, as martial-eagle populations have taken a dive. According to a study published in the journal Bird Conservation International, martial-eagle sightings in South Africa have dropped by 60% over the last two decades, while human population growth across their shared natural habitat has surged. 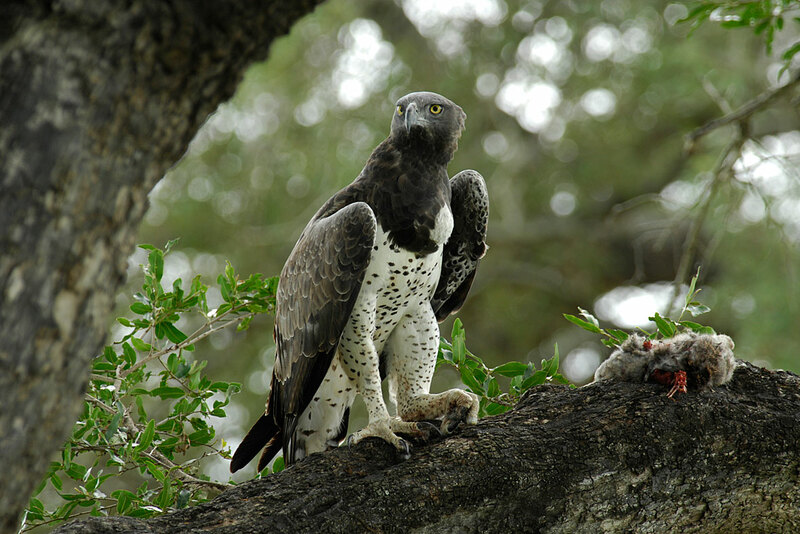 Prior to the new research, carried out by Dr Arjun Amar and PhD student Daniël Cloete from Cape Town's FitzPatrick Institute of African Ornithology, little was known about martial-eagle population trends except that they were "suspected to have undergone rapid declines". In 2013, based on the data at the time, the International Union for Conservation of Nature (IUCN) declared the striking black-and-white raptors as Vulnerable (uplisted from Near Threatened status), citing poisoning, habitat loss, reduction in prey, pollution, and collisions with power lines as reasons for the decision. The latest research adds further data to support the uplisting. To measure the drop in numbers, researchers turned to citizen science. The Southern African Bird Atlas Project (SABAP) calls on volunteers armed with checklists to record bird species seen in a specific area over a given period of time. The first survey was conducted from 1987 to 1991, and it offered a reliable chunk of info against which the study authors could compare the latest data. SABAP2 began in 2007 and will run indefinitely. "These surveys therefore present a unique opportunity to examine changes in bird populations in South Africa over a period of time where there has been considerable development," the researchers point out. What is perhaps most alarming is that the study highlighted a marked decline in martial-eagle sightings within protected areas, including in the Kruger National Park and the famed Kalahari area in the northwest of South Africa. "Whatever is driving these declines is potentially happening across the country at a very large scale, rather than resulting from local processes," the researchers explain in the study. Although declines in national parks have not been as sharp as those recorded in more urban areas (42% compared to 64%), they're still significant. Martial eagles require enormous territories (a single adult can have a terrain the size of San Fransisco! ), so big reserves like the Kruger serve as vital strongholds for the species. And, as Jason Bittel pointed out over at the Natural Resources Defense Council's "onEarth" blog, "If martial eagles can't survive in one of the largest national parks in the world, what hope do the birds have across the rest of the African continent?" According to conservation biologist Rowen van Eeden, who was not involved in the latest study, protecting martial eagles can be particularly tricky. As if their massive home ranges didn't present enough of a challenge, the birds also have a slow reproductive rate. It takes five or six years for a martial eagle to reach sexual maturity, and the birds typically fledge only a single chick every two to three years. And that's if the raptors don't run into trouble with humans. "Despite having full legal protection in South Africa, this species is known to be targeted and killed by farmers who blame the species for predation of their livestock, or may be accidentally killed by poison left to kill other predator species," the authors noted. The cost of human/eagle conflict was also spotlighted in separate research carried out by van Eeden. Data from birds in the Kruger National Park that had been fitted with ultralight GPS backpacks revealed that birds who opted to "fly the coop" and soar beyond the reserve's boundaries were far more likely to meet an unnatural end. Of those four tagged birds, two were killed by hunters, while another was electrocuted after crashing into power lines. It's clear that conflict with humans is playing a big role in the drastic decline of the species, but the exact extent of this still need to be investigated. "We have now quantified the decline of the species in South Africa," said Dr Amar, the study's lead author. "But that is only the first step. We now need urgent research to better understand the factors that are responsible for causing this iconic species to be lost from our countryside, so that these can be better controlled." What's a hawk chick doing alive in an eagle nursery? So far, the eagle parents have been feeding the hawklet alongside their own chicks, but perilous times lie ahead. Audubon reports that Hurricane Irma dealt a devastating blow to the endangered Florida snail kite on Lake Okeechobee. Named after Tolkien's fire-breathing Smaug, the sungazer is a fittingly draconic-looking lizard. But its future survival is at risk.